FOR EASIER READING OF THE ARTICLE, PLEASE SEE TEXT BELOW. Irish-Americans ought to be very aware that we are in a period of important centennial commemorations: the 1916 Rising and the 1918 Irish election when the people of Ireland overwhelmingly voted for national independence and freedom from England. (I use “England” not Britain because one can hardly blame Scotland or Wales for the oppression of Ireland). Those seeking independence won 79 Seats out of 105 Seats. England’s response, of course, was to partition Ireland by the “Government of Ireland Act,” December 23, 1920. But the word “partition” doesn’t quite capture the reality, implying that the country was divided into co-equal parts: North and South. In reality, six Counties in the northeast were torn away from Ireland, which is composed of 32 Counties. And torn, too, from the province of Ulster, which is composed of Nine Counties, not six Counties. Why were County Donegal (the most northern County in Ireland), County Cavan and County Monaghan not included in “Northern Ireland”? 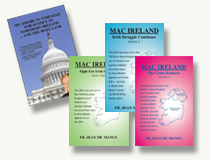 Well—while some may be reluctant to state it— the plain, historical truth is this: had these three Counties been included, there would be too many Catholics in the new, artificial State of Northern Ireland for the British Government and the Unionists to control in what was designed to be an anti-Catholic state. 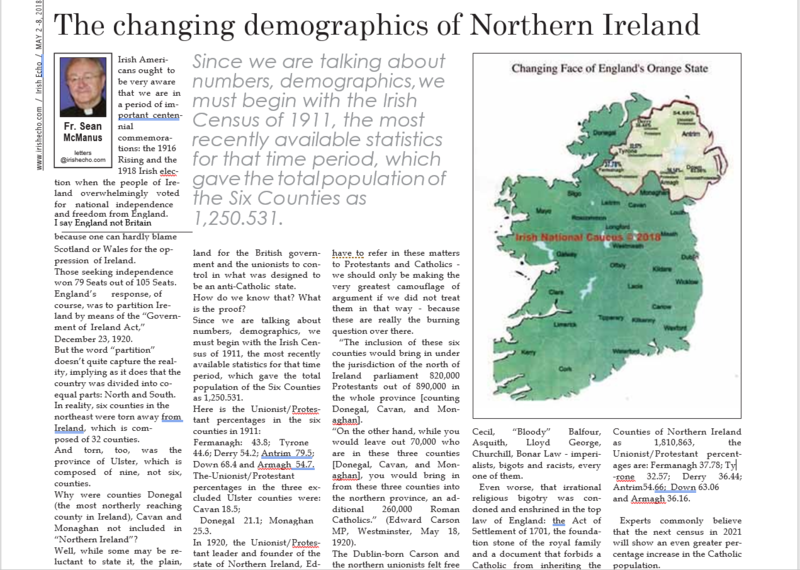 In 1920, the Unionist/ Protestant leader and founder of the State of Northern Ireland, Edward Carson, MP bluntly stated in the British Parliament the reality of these statistics: “The figures will at once show where the difficulty comes in. We have to refer in these matters to Protestants and Catholics – we should only be making the very greatest camouflage of argument if we did not treat them in that way— because these are really the burning question over there. The inclusion of these six counties would bring in under the jurisdiction of the north of Ireland parliament 820,000 protestants out of 890,000 in the whole province [counting Donegal, Cavan, and Monaghan]. On the other hand, while you would leave out 70,000 who are in these three counties [Donegal, Cavan, and Monaghan], you would bring in from these three counties into the northern province, an additional 260,000 Roman Catholics.” (Edward Carson. Westminster. May 18, 1920). The Dublin-born Carson and the northern Unionists felt free to set up their sectarian, anti-Catholic state because they knew that all the top British leaders were deeply and venomously anti-Catholic: Robert Cecil, “Bloody” Balfour, Asquith, Lloyd George, Churchill, Bonar Law — imperialists, bigots and racists, every one of them. Even worse, that irrational religious bigotry was condoned and enshrined in the top law of England: the Act of Settlement,1701—the foundation stone of the Royal Family— that forbids a Catholic from inheriting the English Throne. So, ultimately, it is the unwritten uncodified British constitution that is to blame for religious bigotry in Northern Ireland—the Orangemen were just being loyal to the anti-Catholic bigotry and sectarianism of the British un-written and un-codified constitution. Experts commonly believe that the next census in 2021 will show an even greater increase in the Catholic population. … All of which teaches the obvious truth: gerrymandered, contrived and artificial States do not succeed in the end—especially if they were maintained through inequality, disrespect, and discrimination. All this inexorable progression of history means that the re-unification of Ireland is inevitable. However—pending the re-unification of Ireland—the Beloved Community must be built up in Northern Ireland, based fully and generously on the Good Friday Agreement.